Hallway is the main attraction of any home, this is the first room that meets the households and guests of the apartment or private house. From the manner this utilitarian space is decorated, you can create a first impression of the interior of the entire house. Of course, the design of such facilities as hallways, corridors and all sorts of additional areas near the stairs is changing with the times. 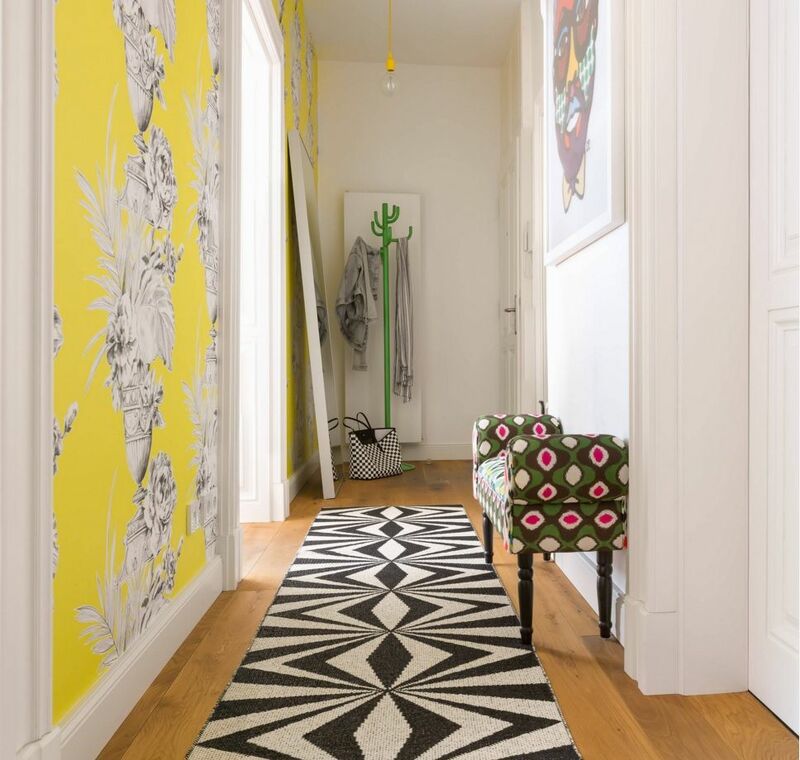 We offer you a selection of real-world modern hallway decoration design ideas, which arrangement will be topical in the coming season. the resistance of the floor covering to mechanical impact and hits after objects of significant weight falling. 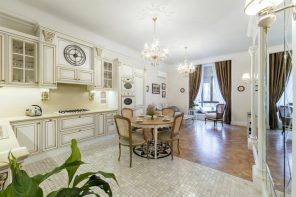 Not only in the hallway, but the majority of additional spaces, modern designers are advised not to bee too clever by half and not organize complex or expensive design. Perfectly smooth and even ceiling, as a rule, in the light perspective is the most popular way of finishing. The fastest way to arrange the ceiling with the help of tension design. As a result, you`ll get a completely flat surface. But it`ll have one drawback – the lack of possibility of embedding fixtures. You can use pendant models only. If you use the suspension structures, there would not be any limitations regarding lighting systems. If the hall has a smooth continuation in another room or separated from it with door or interior walls, it would be logical to arrange the ceiling same in every space. Perfectly smooth, white ceiling is the most successful variant that is not only visually enlarge a small space, but does not create problems of conjunction between colors of walls and floors. A great way to visually expand the space is to use glossy stretch ceiling. 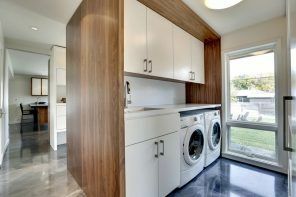 Coupled with a brilliant gloss flooring, utilitarian space will appear larger than it actually is. The white walls is the perfect design idea for small spaces. If you use liquid or vinyl wallpaper with the ability to cleanse surfaces, or painting with latex paint, or white wall panels – you`ll got no problems with regular maintenance. But your light walls are the perfect backdrop for any wall decor and bright furnishings. Design techniques for creating the accent walls are applicable to other additional areas such as hallway or corridor. You can use wallpaper with a pattern or a wall panels with a photo-printing in combination with monochromatic, light-colored surfaces. You can support the bright color accent wall can be through the use of the same shade in the lighting fixtures or accessories hallway, for example, for the execution of hangers or hooks for clothes. 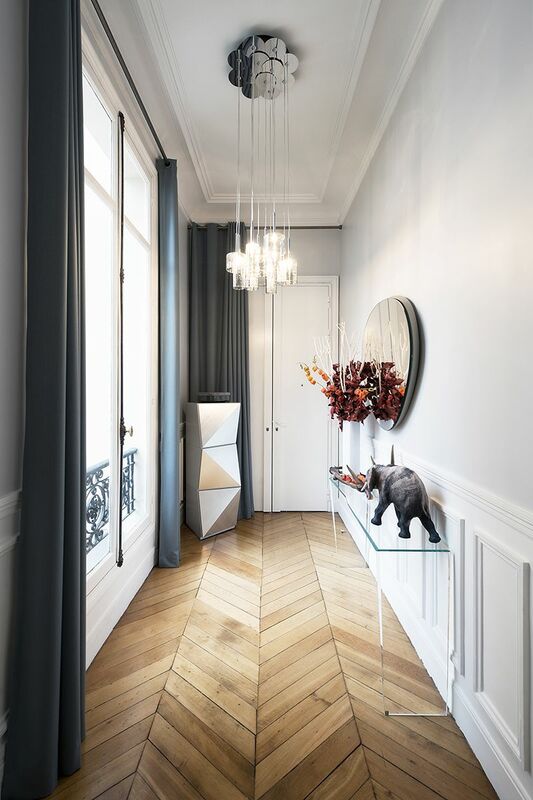 In the modern design projects of hallways and other additional facilities we can often see contrasting combinations of black and dark gray tones. This adds some flavor of brutality and rigor to the interior of the premises. Another way to trim an extra areas is facing with wall panels. 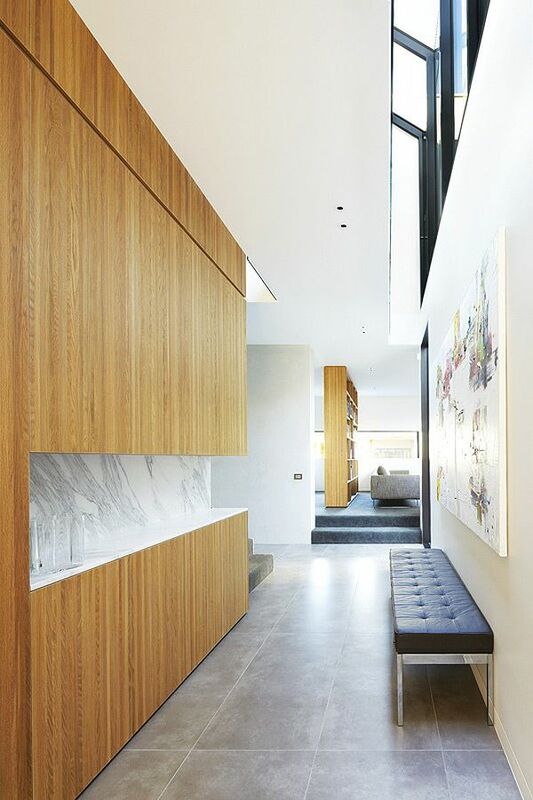 Products, simulating and composed of natural materials (like wood), would have particularly impressive look in the hallways of the private homes. Imitation of concrete surfaces is the trend of the season. Liquid or vinyl wallpaper, decorative plaster and metallic compounds may suit these purposes,. Brick wall as a way to furnish additional space is yet another interesting and highly popular design method. The interior will receive a small dose of industrialism and brutality. And you`ll have the original textured wall coverings that can be a highlight of the design. 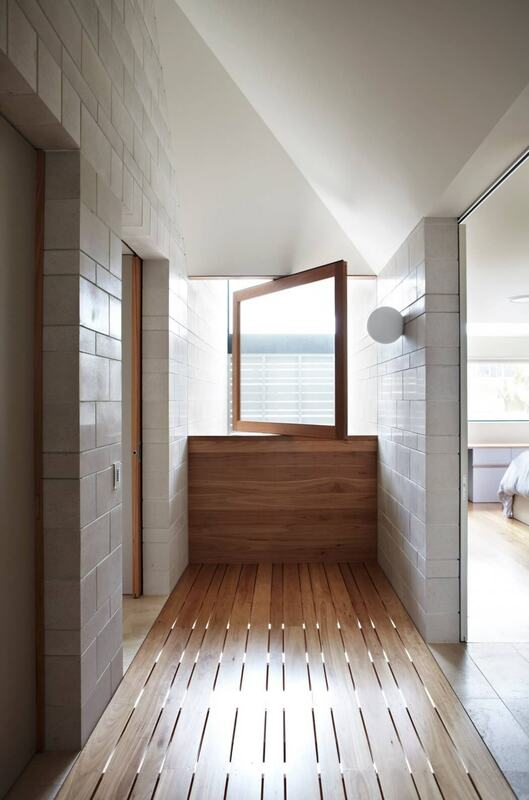 Stone or ceramic tiles is an ideal design for the hallway, especially in the private house. It is durable, reliable and easy-to-use way to make a floor covering, which, among other things, will give the interior a special charm. For greater protection from pollution, you can build a sort of a wide plinth made with ceramic tile, the height equaled to one item. Figured floor tiles, if still of different shades, can become a highlight of the interior. This motley floor covering will not only last for years, but will decorate the space with a neutral, monochromatic furnishing. The laminate as a floor covering can be used without problems in the corridors and spaces of the stairs. But it is better to use more moisture resistant material for the area at the entrance of the home. You can use the tiles to lay a segment near the front door, and face the rest of the floors in the hallway with laminate. Parquet, laid in a herringbone, way is always in trend. But such choice is not the best solution in terms of care for the surfaces exposed to moisture and dirt. But this method of flooring design will look luxurious for corridor space. An interesting way of bringing an element of surprise into the design of the hall is the use of 3D-coating pattern. Such a surface is easy to care for, and the external effect compensates any material costs. Hallway without storage systems is an irrational way of using space from the standpoint of many homeowners. In our latitudes it is too diverse climate and we need to have an umbrella and rubber boots, warm clothing and a hat from the sun on hand before going out from the house. 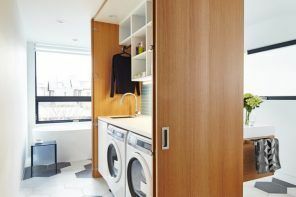 Depending on the size of the hallway, it may contain from a small stack to accommodate a shoe closet to a full-wardrobe to store all the family`s seasonal outerwear. Built-in storage in a closet from floor to ceiling is an option for large families or apartments, where is no possibility of placing most of the family wardrobe in the other rooms. For such a massive structures white is color for decoration is most preferred option. Do not worry about possible contamination of the white surfaces. If the front of the cabinet is covered with PVC film, you`ll avoid problems with cleaning the dirt. 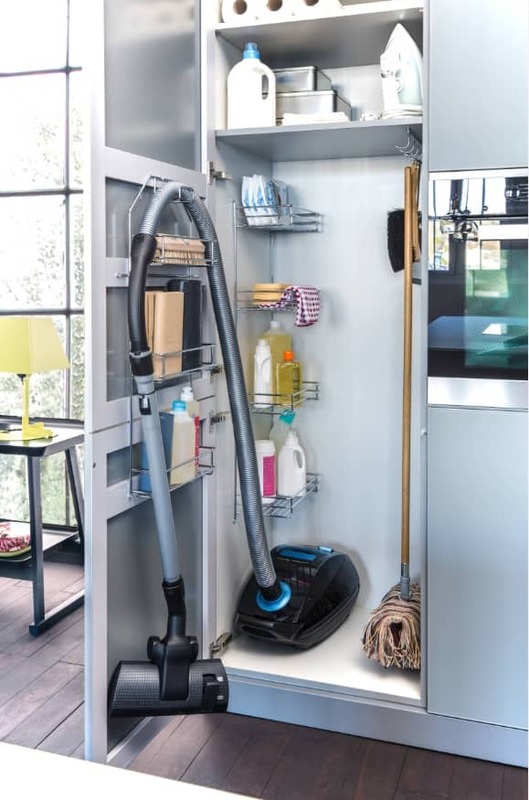 Corridor space can also be used efficiently to accommodate storage systems. Shallow shelving with open shelves can be installed even in small spaces. They do not take up much space and does not look too monolithic, big, thanks to the open facades. Storage systems without handles, with smooth facades or recesses instead of accessories are ideal for narrow corridors and hallways. Bright shades of cabinets` decoration and other storage systems will help visually expand a small space. Modular system of cabinets assembling with smooth facades is a modern design solution. Such cases modules can not only organize the storage system but also can serve as a room divider. The alternation of open shelves or closed cabinets in massive storage systems, occupying an entire wall of the corridor or hallway, allows to deprive the effect of monumentality of the structure that can visually “push” the present. Open shelves with lighting are perfect to defuse the situation. Low chest of drawers with a mirror above it is not only functional, but also externally attractive couple. Such an alliance would look especially harmoniously if the manufacture of chest and mirror frames was implemented with the same materials. The original method of organizing of the storage systems is the use of metal lockers that were used in the dressing rooms of public buildings. 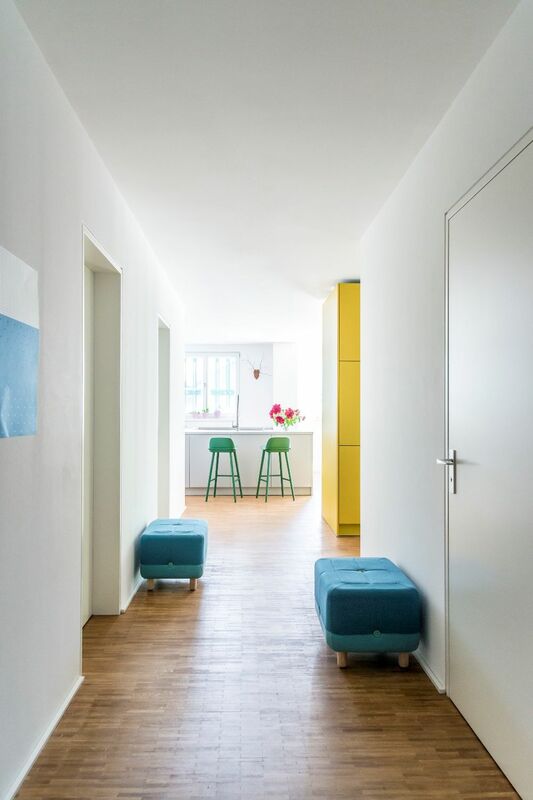 Bright color of the original appearance of nontrivial storage systems can become a highlight of the interior. The space near the stairs or in front of one of the rooms is a great place for arrangement of home library. 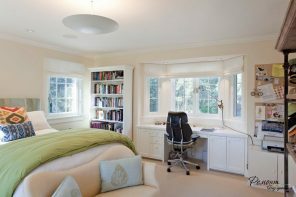 Bookcase should be located at the wall with a window opening and around it, and a comfortable chair with a floor lamp and a table stand – in the front of it. 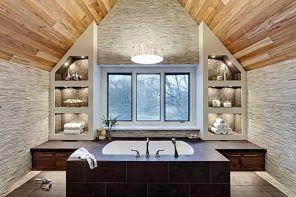 If additional space is located in the attic, then adding bonus of a large bevel ceiling to a small space. But even in such a complex shape we can install roomy indoor storage. Use for the lowest ceiling height for its location. Most of the hallways and corridors, especially in model homes, do not have a source of natural light. So the question of space equipment with lighting sources is very acute. None of us wants to go out in the morning at home in untidy appearance, without noticing flaws in your own image. Therefore, a sufficient level of hallway lighting should be a priority in the final stage of facility arrangement. 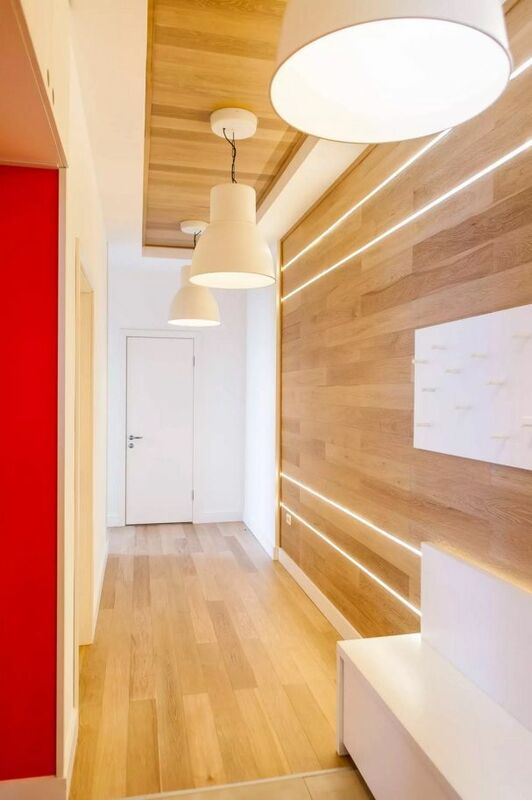 Apart from the central system or embedded pendant ceiling, hallway mirror lighting is important. It can be both using LED strip in the perimeter of the mirror frame and a pair of symmetrically disposed wall sconces. Beautiful hanging chandelier with a variety of decorative elements, or hanging lamp with original design is able to radically change even the most trivial design of the hall. It’s enough to have the ceiling height a little higher than the standard. 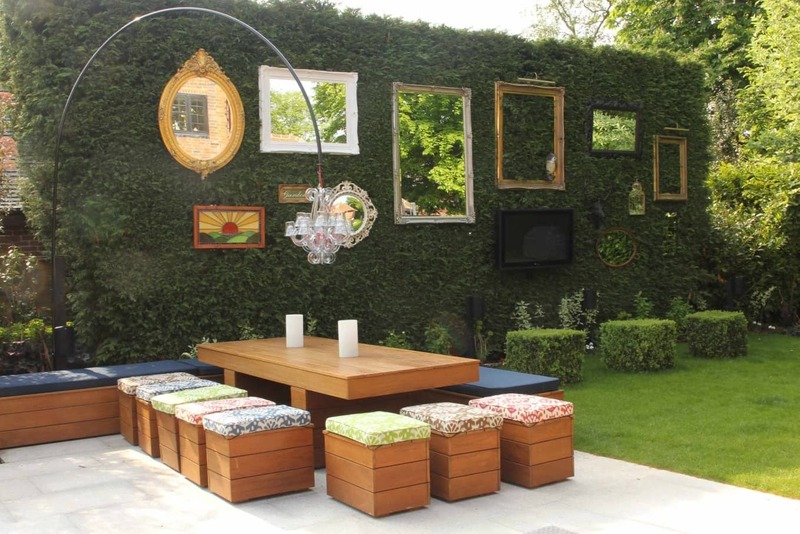 Due to the small area of ​​additional space, outdoor decor is usually excluded by both designers and homeowners. But for wall decoration there is considerable scope for imagination. It may be a picture of your favorite artists or a collection of your own family photos. hallway or corridor walls are ideal background for family photos hanging in frames or collectibles. You just need to take care of the light walls, if the framework will be dark, and vice versa – a dark, neutral background color if the photo will be in the white frame. Also, the room should have the necessary level of illumination, so that everybody could see your collection. 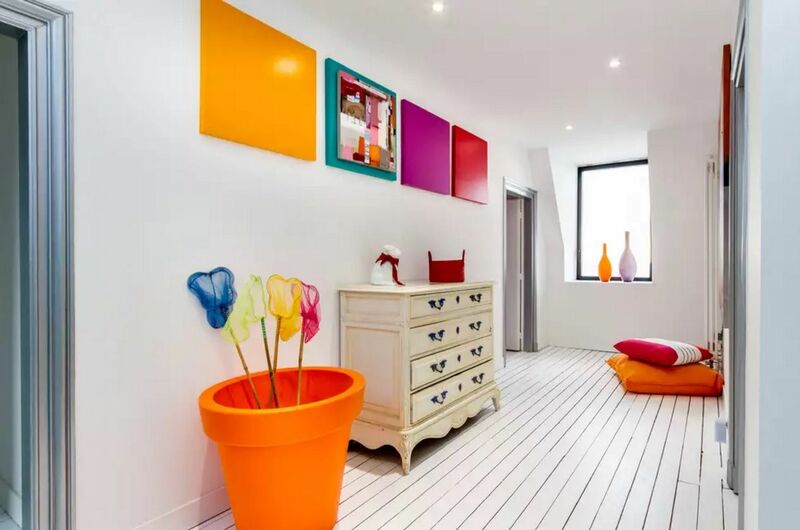 Bright wall decor is able to radically transform the interior of the hallway or corridor. The colorful décor would have particularly striking look on the bright background of the walls. Mirror is the main decorative element of any hall design, which bears functional load among other things. 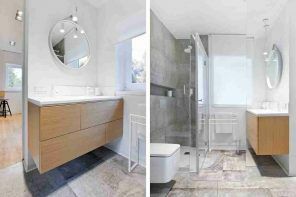 A large mirror in one piece or composed of elements of different shapes will not only provide you an opportunity to watch your reflection in the full, but will also create a visual extension of the space. In addition, the mirror surfaces increase the room lighting. And hallways are almost always critical to this parameter. A large mirror in a beautiful carved frame is not only a functional element of the interior, but also a great decoration for the hall, which is capable to decorate any modern design.